Properties in Runnymede average 4.7 out of 5 stars. Property 33: Sandy Bay - Tranquil surroundings with parking and views. Beach Rd Cottage Good Value Delight, ten metres from waters edge. Property 50: Beach Rd Cottage Good Value Delight, ten metres from waters edge. 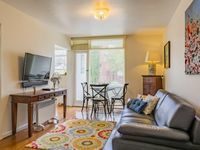 Arwen&rsquo;s Abode is a comfortable, cleverly designed space a short walk from the Salamanca Market, the Harbor and Battery Point. The host provided cereal for breakfast as well as a nice selection of condiments, which allowed us to eat a couple simple meals there, which we greatly appreciated. I would definitely recommend a stay. Thanks to Joe for being so humble. I have never seen anyone so welcoming. The place is perfect .